This episode featured the toughest assignment the four contestants have had to face, their chance to be an Iron Chef. Bobby Flay, Michael Simon and Alton Brown met the finalists in a make shift Kitchen Stadium to lay down the rules of the game. 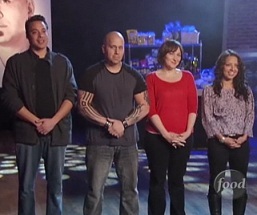 The contestants would be paired off with an opponent and then receive a mystery ingredient. They would then need to create three dishes with the mystery ingredient within one hour to serve to the selection committee for judging. In a surprise twist this year the competing opponent will also sit in on the judging. Just so that nobody sat idle, when one set of finalists were cooking, the other two would have to provide some commentary with Alton about what was going on in the kitchen. Due to Jeff's win in the last episode, he got a few perks in this competition. The first bonus was that he got to pick the contestant that he would face off with in the competition. He picked Susie because she looked really eager to cook, only thinking later that he just picked the best chef on the show to go against. Jeff's other bonus was that he got to choose who his sous chef for the competition was. Alton Brown trotted out past contestants Whitney, Chris, Penny and Jyll. Jeff immediately picks Whitney and Alton informs the rest that they will be paired up by random draw. Vic draws Jyll, Susie gets Chris and Mary Beth is hilariously linked up with her arch nemesis Penny. So now dear reader, with an open heart and an empty stomach, we say unto you in the words of someone who isn't our uncle: ‘Allez cuisine!' As everyone knows that is the international phrase for "Hey, check out this mystery ingredient" and it was time for Vic and Mary Beth find out they would be cooking rack of lamb. Mary Beth's idea was to cook lamb chops in three different seasonal ways. Mary Beth did run into a bit of a roadblock with Penny chopping things incredibly slow. Penny was so slow that the judges eventually had Alton go talk to her about speed. It was more than obvious that Penny was working so slowly in order to sabotage Mary Beth. Her dishes were successful in concept and her culinary point of view but failed in execution. Most of her lamb chops were over cooked. Vic decided to cook lamb in much more imaginative ways in honor of the iron chef theme and he hit some major highs but some really horrible lows. His seared lamb loin and lamb burger were a hit but his fries were burned and his broiled lamb chop with mint jelly glaze was almost inedible. Mary Beth was by far the best judge and really utilized her writing background in order to describe the food; its flavors and triumphs/flaws. When it came time for Vic to judge, he wanted to play the nice guy and did not critique the food as honestly and accurately as he could. He used the term "but overall, it isn't a bad dish" in all three of his judgments. Don't think we forgot that the waiting chefs were doing commentary. Jeff really was the stand out commentator for the entire show. He was funny, charming, and came off as very knowledgeable. Susie seemed to fall back on her cute girl features and did not have a lot of information for Alton Brown. We wouldn't go as far as to say that she did poorly as there were other contestants that did worse but she was clearly in the shadow of Jeff's performance. The next round found Jeff and Susie having to use lobster as their secret ingredient. Chris and Whitney were obviously pretty adequate sous chefs as we hardly even saw them in the competition. Jeff reached deep into his sandwich concept to turn out three tasty, if slightly flawed, dishes. Jeff's biggest mistake was that he had used store bought mayonnaise in each of his dishes instead of making his own. Susie on the other hand just knocked it out of the park with a trio of delicious dishes. In every meal Susie made the lobster the star and showed real creative twists on traditional dishes. While Jeff and Susie were cooking Vic and Mary Beth were being questioned and stumped by Alton. While Vic got caught up on explaining what harissa is as Susie used a harissa paste in her dishes, all Vic got out was that it was a spice paste and referred to it as "toothpaste for the devil." While funny, it did not impart any information to the viewer. Mary Beth got caught up on what was ultimately a trick question from Alton. He asked her "What salt isn't sea salt?" She was taken aback and was wracking her brain for the answer. Alton finally told her that all salt is sea salt and we can all say we finally learned something from Food Network Star. When it came down to the final judging by the selection committee, Vic and Susie were the winners leaving Jeff and Mary Beth up for elimination. Jeff was in trouble for the lack of hand made mayonnaise but he got some major praise because he legitimately charmed Alton. Mary Beth was given a bit of slack due to the fact that she had a major handicap with Penny as her sous chef, but she really does bring food to life in an exciting way. After some debate by the selection committee it was decided that Mary Beth would be leaving the competition. While Mary Beth is heart broken she still believes in their mission to find a Food Network star and was more than grateful for the experience. Food Network Star airs Sunday 9/8c on Food Network. Tune in next week for the season finale! You can catch more of Allison and Bryan on their weekly podcast at notmakefriends.com.